Neat Video Review: Many professional or amateur photographers probably own or have come across "Neat Image" at some point. Neat Image is a plug in or standalone product that allows you to control, reduce and eliminate grain or digital noise from your images. Wedding photographers find this particularly useful as they tend to shoot a lot in low light situations. Even with today's more advanced DSLR's, there is still a big need to keep images noise free. For example, stock photo agencies insist on having the cleanest images possible for their clients. It is imperative to either shoot clean or use software such as Neat Image to clean them up. In addition, Neat Video can make video look sharper without any degradation of quality. The combination of the sharpening and noise filter makes such an effect possible." After filming a camera review in low light conditions recently, I got hold of Neat Video to see how it stood up to Neat Image. I have used Neat Image for years and was surprised at how easy Neat Video was to use once installed. I use Sony Vegas Pro (currently version 15) and have used this software since version 8. There is just something about it that I find simple to use but at the same time, it has a ton of creativity and features that suit me down to the ground. For audio it is fantastic too. To install Neat Video into Sony Vegas, all you need to do is follow their quick and simple instructions. They provide you with an installer program that automatically makes the software available in Sony Vegas Pro or whatever software you have bought this for (see above for availability). Press configure and that will open up the Neat Video Interface. Before doing this, please make sure that your video is on a clip or frame that has an area of uniform noise. It must be an area without any significant detail such as a wall. This allows Neat Video to make a decent noise profile without getting "confused" by other detail that should be there. See the green box in the image below? That is the area I have chosen for this tutorial. It contains noise artefacts and very little detail. At this point you can tweak and play with the settings and sharpness. However, I find Neat Video does a pretty good job on its own. Once happy with the results, you just output the footage as normal. 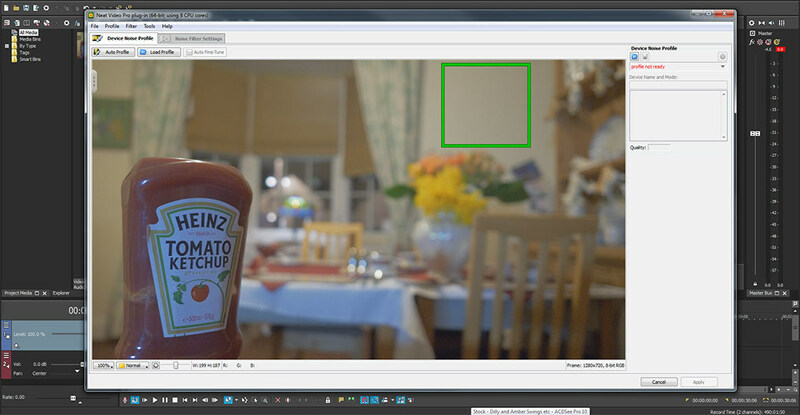 You can really see the difference in noise as the footage plays when rendered. Some features are only available in the Home or Pro plug-in. System requirements for practical use of Neat Video depend on frame size and length of video clips. This is because processing larger frames and longer clips takes proportionally more time. The processing speed is determined primarily by the processor number-crunching power and memory speed. The Neat Video plug-in can process any RGB video clip supported by Sony Vegas. The plug-in may be compatible with newer versions of Sony Vegas as well. Check out the full compatibility list at the Neat Video homepage linked below.